With Mexican produce taking its place on store shelves, there’s no reason I shouldn’t turn the heat up a little. I’d been adding chili to my chocolate for years, but had mostly stayed away from fresh peppers. I decided to start at breakfast with a recipe for huevos en rabo de mestiza, eggs poached in a tomato broth made of sauteed onions and poblano peppers. 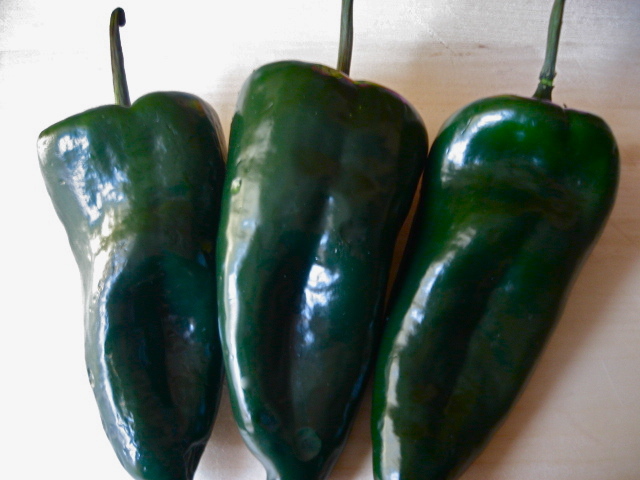 While poblanos are only considered moderately hot, they’re scorching compared to the bell peppers of a Cuban sofrito. Also, I’ve always liked the extra step of charring, sweating and peeling peppers. The scent of roasting peppers permeated the kitchen the moment I set them under the broiler. It was pretty straightforward after that. Used to chasing eggs around a pot of vinegary water when poaching, the rabos (rags or tattered clothing) made of thinly sliced onions and peppers created a perfect nest for the eggs to tuck into while they cooked. I’m not sure if it was the poached eggs, the pepper cloud, or just trying something a something new for breakfast, but it left me feeling very much awake. Click here for a complete pepper guide. This recipe is adapted from Diana Kennedy’s The Essential Cuisine of Mexico. With no immediate plans for hosting brunch, I decided to cut the recipe in half for midweek portions. I also used canned instead of fresh tomatoes. With the disappointing crop of summer tomatoes and because we’re in the dead of winter, I’ve been relying on organic canned tomatoes for months. I’ve indicated below the amount and directions used in the original recipe if you’d like to use fresh tomatoes. The sauce can be made ahead of time and reheated just before poaching the eggs. Heat the oil in a large skillet over high heat. Add the onions and saute until translucent, about 3 minutes. Add the green peppers and sauté an additional 2 minutes. Add the tomatoes and simmer over high heat until the sauce is slightly reduced and the flavors are concentrated, about 5-7 minutes. Add water and salt to taste, and reduce heat to a low simmer. Crack eggs into small bowl and slip into tomato broth one a time. Top with cheese. Cover and cook until set, about 5-7 minutes. The original full recipe called for 2 lbs (900 grams) of broiled tomatoes. The tomatoes should be blended for a few seconds but still retain some texture then added to the onions and peppers. If using in the recipe listed above, the amount of tomatoes should be halved.